Concerns over consumer debts have abated lately as credit growth has slowed and the U.S. economy has improved. Trouble could still be lurking. The New York Federal Reserve’s quarterly report on household debt earlier in May showed total consumer debt grew by 3.8% from a year earlier in the first quarter, significantly slower than the average 4.5% over the previous four quarters, thanks largely to a pullback in auto loans. Overall delinquency rates also declined slightly because of improvements in student loans and mortgages. But in the two areas where lenders have been most aggressive over the past few years—credit cards and auto loans—delinquencies have continued to mount. Credit-card loans that are more than 90 days delinquent rose to 8% of total balances in the first quarter from 7.5% a year earlier, according to Fed data. The portion of delinquent auto loans rose to 4.3% from 3.8%. Although the volume of auto-loan originations has slowed, terms remain loose. The average length of a new loan rose to 69.2 months in April compared with 65.5 months in April of 2013, according to Edmunds.com. 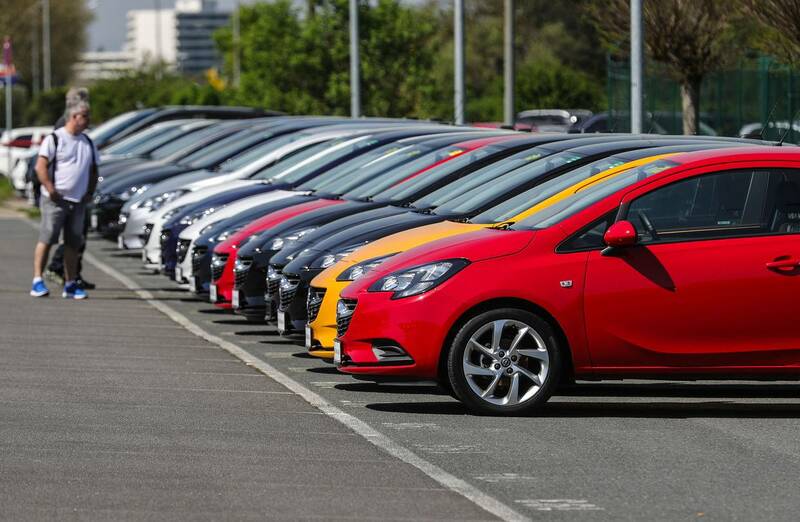 A flood of cars coming off leases also has pushed down used-car prices. In April used-car prices fell 1.6% from a year earlier, the biggest decline since March of 2009, according to Labor Department inflation data. A brisk economy, with falling unemployment and rising wages, seems to be keeping defaults from rising to worrying levels. 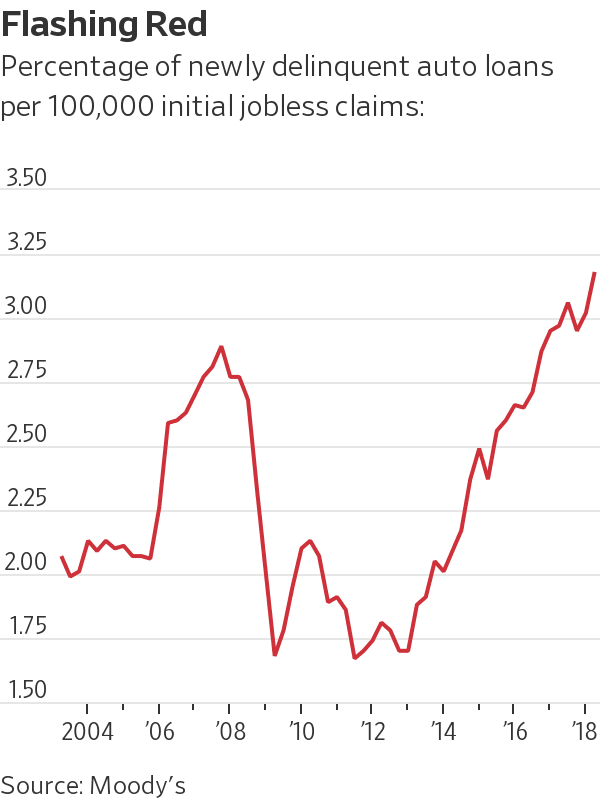 In a recent note, analysts at Moody’s adjusted for this by comparing the percentage of loans recently becoming delinquent with the level of initial jobless claims. They found that new delinquencies per 100,000 initial jobless claims have been rising for both credit cards and auto loans. This ratio remains within a normal historical range for credit cards, they found. But for auto loans it has risen to its highest level in at least 15 years. This strongly suggests that auto lending standards have been extraordinarily loose in recent years. Auto loan defaults “should be much lower given the strong employment market, pointing to underlying risk in the loan portfolios that is likely well above historical standards,” Moody’s said. So long as the economy is booming, this may not matter. But when the economic cycle does turn, the accompanying turn in the credit cycle will be all the more vicious. Look to auto loans for the biggest fallout. You can be in a customs union without a border, or outside a customs union with a border. There is no example anywhere in the world where this is not true. 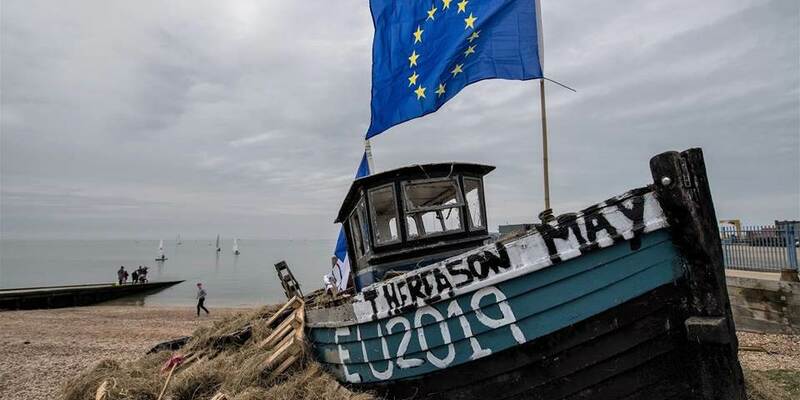 Yet reintroducing a border on the island of Ireland raises serious problems, affecting not just cross-border trade, but also security and the future of the Good Friday Agreement that brought peace to Northern Ireland 20 years ago. After all, it is well known that, in trade negotiations, the bigger partner tends to do better than the smaller one. And the UK’s position will be weakened further by technical issues like rules of origin. At present, the country benefits even when parts of a product are manufactured elsewhere in Europe, up to an agreed limit. The loss of that flexibility will pose a major problem to car manufacturers, among others. Is the eurozone crisis back? Italian government bonds have moved even more violently than during 2011-2012. A key question now is how far the ripples spread across the eurozone. Investors should watch Spain. Spain and Italy once traded places on the front line of the eurozone crisis. Spain was under greater pressure in 2012 when European Central Bank President Mario Draghi’s pledge to do “whatever it takes” turned the tide. This time round, Spain’s bonds have only stumbled—the 10-year yield has risen to just over 1.5% from a low below 1.2% in April—while Italy’s have been hammered. The gap between Spanish and Italian 10-year yields has hit levels not seen since 2011; the gap between Spain and Germany, at 1.2 percentage points, was often seen in 2017. 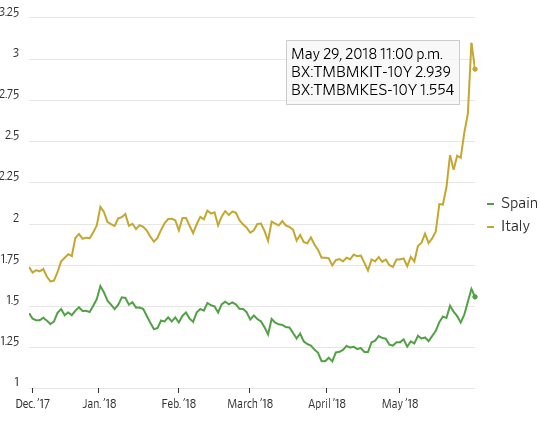 That Spanish bonds get caught up in bouts of risk aversion is a legacy of the crisis: All Southern European government bonds are recognized as containing a mix of credit and interest-rate risk. So some spillover is unavoidable. Real contagion would require investors to decide that Spain and Italy shared similar vulnerabilities. For now, that looks a stretch. 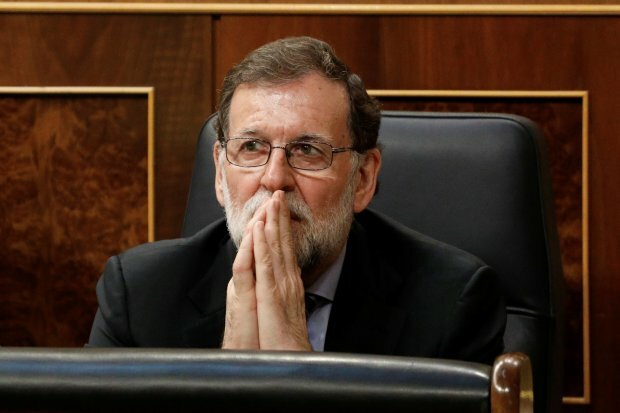 Yes, Spain faces its own political challenge in the shape of a no-confidence vote in the minority government led by Prime Minister Mariano Rajoy, as well as lingering uncertainty over Catalonia. A snap election could jangle nerves. But there is nothing like the uncertainty caused by Italy’s crisis. 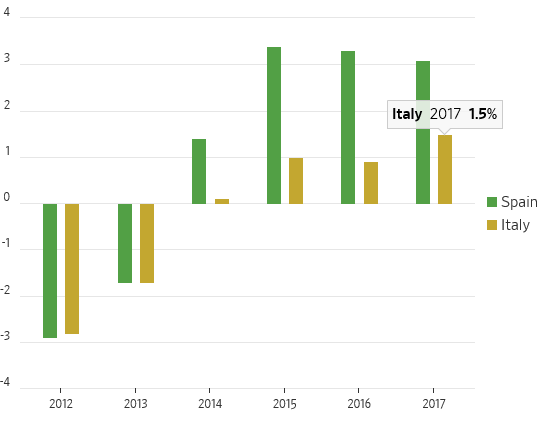 The political climate in Spain is much more pro-European, perhaps because its economy has been growing at a 3% clip in recent years, far above the pace recorded by Italy. Spanish unemployment has also fallen sharply in recent years. Meanwhile, the strong market forces that drove eurozone yields down in recent years are still in play, with the ECB only expected to exit gradually from its monetary stimulus. During the previous crisis, a lot of eurozone countries looked alike, creating contagion. Now Italy really stands out. The current selloff in Spanish debt looks more like an opportunity than a reason for concern. A crash is coming, and it may be terrific…The vicious circle will get in full swing and the result will be a serious business depression. There may be a stampede for selling which will exceed anything that the Stock Exchange has ever witnessed…Wise are those investors who now get out of debt. Stocks had never enjoyed such a bull market before, and this led many to believe that “the sky’s the limit.” All over the US, people put all the money they could find into stocks. Then, wanting to buy more, they bought on margin. Then, wanting still more, they borrowed privately to buy on margin—a double-dip into debt. In essence, this meant that a large portion of the extreme bull market was the result of stock investments that were made with money that didn’t exist—a mere “promise” to somehow pay, with nothing to back that promise up. This, of course, is the very essence of a bubble. And, sooner or later, bubbles pop. However, it was predicted by those who understood market bubbles. Roger Babson, in particular, made the statement above to the Annual Business Conference in Massachusetts on 5th September, 1929. At that time, he was vilified by Wall Street for making such an obviously false proclamation, yet, after the crash, he was again vilified for having brought on the crash with his statement. Neither was true and no lesson was learned by those who created the crash. Yet, it was the logical conclusion to the buildup of events. In fact, there could have been no other outcome… and the same is true today. The $20 trillion debt that the US government has created is far beyond anything the world has ever seen and, in fact, it exceeds the total of all other countries combined. To add insult to injury, the unfunded liabilities of Medicare, Medicaid, Social Security, etc., bring the total real debt to over one hundred trillion—an amount so large that not even the interest can be repaid. Although Republicans have traditionally railed against debt, they’ve recently voted in a dramatic tax cut, with no corresponding cut in federal spending. This is akin to an addict giving himself a shot of heroin. A brief period of investment in business will occur, but, within a year, will be followed by a deeper tightening. In addition, dramatically increased spending has been approved. Republicans have joined Democrats in the elimination of budget caps on defense (read: foreign invasions) and domestic spending. Entitlement spending is higher than at any time in history, yet that, too, will be expanded. Hence, both Democrats and Republicans are on board for dead-ended economic policies that will lead to a depression. The present economic condition is riper for a crash than ever before in history. In 1929, it was triggered by the central bank raising the interest rate, assuring that those who were up to their chins in debt were now underwater, as the cost of borrowed money had just risen. And of course, the Fed has raised rates repeatedly in the last year and has announced that it will raise them five times more over the next two years. Which rise will prove to be the trigger this time around? All right, so a crash appears inevitable, but surely, a crash does not ensure a depression. So, let’s have a look at the events that took place after Black Friday in 1929 that sent much of the world into a prolonged economic collapse. The Smoot Hawley Tariff of 1930 introduced “protective” tariffs that instead sparked a trade war with other countries. Today, there’s a slight difference. Rather than wait for a crash, the US government has created major tariffs prior to the crash, speeding the process up. Announcements have been made that more may be on the way. Throughout the “roaring 20s,” the demand for goods rose at an unprecedented rate. This has been blamed on greed by some economists, but, in truth, it was fueled by a loose-money policy by banks, willing to offer loans to all and sundry. Today, the level of money-lending is far beyond that of 1929. Never before in history has the private sector debt level been so high. Its total now exceeds the total of private sector assets. The banks had provided the loans that created the spending spree. When they went into liquidation, the demand for goods dropped off dramatically. As sales dried up, countless people lost their jobs. 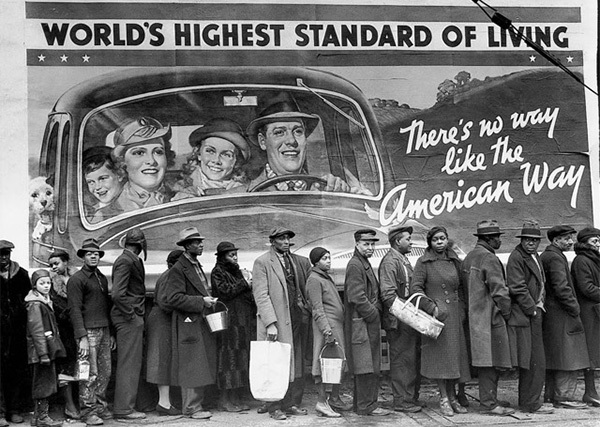 And many of those jobs never came back, assuring that the Great Depression would far outlast any previous depression. All of the conditions that were present in 1929 are once again in place today. Although we can’t project a precise trigger date for the bubble to burst, it most certainly will—as do all bubbles. But, what we can do is anticipate that, historically, the crash and its subsequent damage are invariably equal to the level of indebtedness. As the present level so far exceeds what existed in 1929, we can presume that the crash itself will be far more devastating, as will the subsequent damage. The Depression Playbook has been faithfully followed. However, the reader need not choose to play. If he sees fit, he can opt out. Although time may now be rather short, he may choose to do all he can to remove himself from the system, so that his own economic life is impacted as minimally as posible.